"I was a Manchester resident for more than 20 years before joining the Garden Club. Through the club, I've had the satisfaction of being able to give back to my community while making many good friends, and having fun all the while." "Being new to town, my husband Bill and I are so glad we joined the Manchester Garden Club. We've made lots of terrific friends, gained pride through our club activities-like planting the town gardens, learned and shared growing tips and even won awards at the CT Spring Flower and Garden Show!" 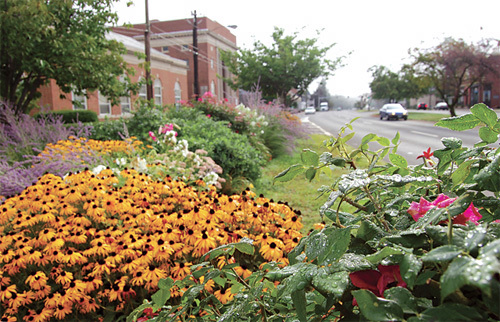 The Manchester Garden Club supports five community gardens. Members share these responsibilities, enjoy giving back to the town, and find that friendships are forged as they work together. Located at the intersection of Main and East Center Streets, garden was dedicated in 1967. For more than 40 years the club has continued to plant and maintain this centrally located garden. It is a true testament to the commitment Manchester Garden Club has to beautifying our community. Initially, the Club planted this space along East Center Street as part of the Town's Beautification Project. At that time, only junipers were planted in the space. In 1967, this garden was part of a town wide beautification planting of annual flowers. Over the years, the garden has continued to change. It has also been a gardening challenge, as this esplanade is located between three lanes of heavily traveled roads through the center of town. The fumes from the cars stopped at the traffic lights and stop sign have made it impossible to grow certain types of flowers at the site. For more than 40 years our club has continued to plant and maintain this centrally located garden. It is a true testament to the commitment Manchester Garden Club has to beautifying our community. 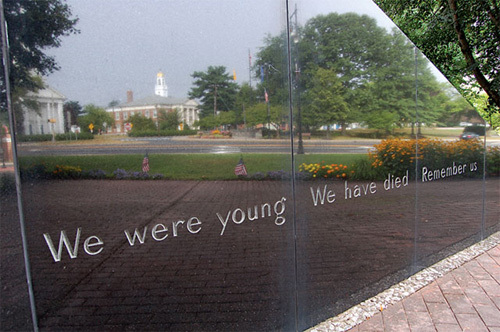 The Vietnam Memorial Park Garden was dedicated on Memorial Day, 1985, and is located at the corner of Main Street and East Center Street. In 1984, our town leaders and the Vietnam Veterans asked the Manchester Garden Club to assist with a small planting in the newly established Vietnam Memorial Park. The garden has seen some changes over the years as members worked with the veterans to improve the garden to enhance the beautiful granite memorial on the site. This memorial is a smaller replica of the Vietnam Memorial in Washington, DC, and honors 14 of our town's fallen soldiers. Initially, there were two small circular gardens at either end of the brick sidewalk that passes in front of the memorial. Soon these two gardens were extended into one long garden along that sidewalk. The Civic Improvement Committee eventually approached the veterans with yet another new design for the gardens. That design created two, much larger, triangular gardens. The expanded space allowed for a more massive planting and complimented the triangular shape of the memorial. In the mid 1990's, the committee decided to redesign the plant material in the garden, adding tones of yellow, gold, pinks and blues to the previously used red, white and blue theme. Most recently, perennials were added to enhance the garden and extend the growing season. For more than two decades, honoring our veterans and beautifying our community with this on-going garden endeavor has given club members a great deal of pride and satisfaction. Photo by club member Dena Matthews, was featured in the 2010 National Veterans Calendar, "Vietnam Veterans Memorials From Across America." 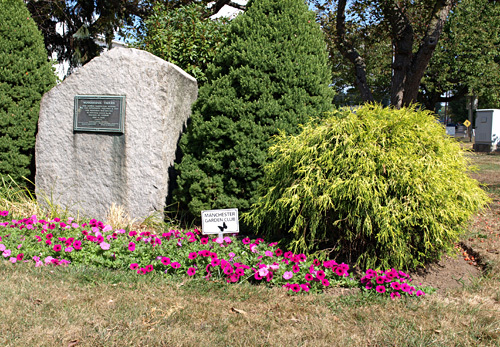 The Buckley Memorial Garden was dedicated September 29, 1994 and is located at the Manchester Green. The garden is in memory of Mr. William E. Buckley, author and teacher, and his sister Miss Ellen Buckley. Mr. William E. Buckley, author and teacher, served as president of the Manchester Garden club from 1936 - 1943. His sister, Miss Ellen Buckley, also a member of the garden club, never served as president but was extremely active in the club. She is best remembered for her outstanding floral arrangements. The plantings in this garden include, the Mountain Laurel 'Raspberry Glow', two Alberta Spruce, two Crimson Pygmy Rhododendrons and two Yellow String Cypress. Daffodils are also planted as they were one of Mr. Buckley's favorite flowers, planted on their property on East Center Street. Mrs. Marie Langrill and Mrs. Betty Miller, both nieces of the Buckleys, were present at this dedication. Mrs. Phyllis Boss, former student of Mr. Buckley and long time friend and garden club member with both of them, gave the dedication and held a tea at her home afterwards. Coordinator and chairman of this special project was Mrs. Joan Kelsey, the club's Historian. The Gateway Garden is the Manchester Garden Club’s newest garden, created in partnership with the Downtown Special Services District. It was "Planted Pink" in support of breast cancer research and education. 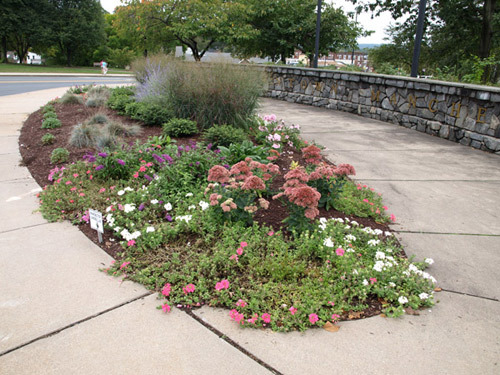 In 2011, the Manchester Garden Club completed the installation of their newest civic improvement project, the Gateway Garden. Located at the western corner of the intersection of Center Street and Main Street in Manchester, the Gateway Garden accents the stone wall with the Downtown Manchester signage in brass letters. The Gateway Garden is the first project that also serves the additional purpose of raising awareness of issues outside of horticulture - specifically, breast cancer. The "Plant it Pink" national initiative has engaged garden clubs throughout the country to make use of this color and specially grown plants in civic projects. In the photo below, members are holding containers for plants grown especially for this initiative. For those interested in planting similar plants in their own gardens, here is a list of what’s in the Gateway Garden: Knock Out Roses, Perovskia (Russian Sage), Sedum 'Autumn Joy', Phlox 'Bright Eyes', Buddleia (Butterfly Bush) 'Tutti Frutti', Aster novi-belgii 'Alert', Ilex crenata 'Helleri', Panicum virgatum 'Heavy Metal', Festuca cinerca 'Elijah Blue', Salvia pratensis 'Pink Delight', Geranium cineraum 'Ballerina' and Echinicea 'Kim's Knee High'. 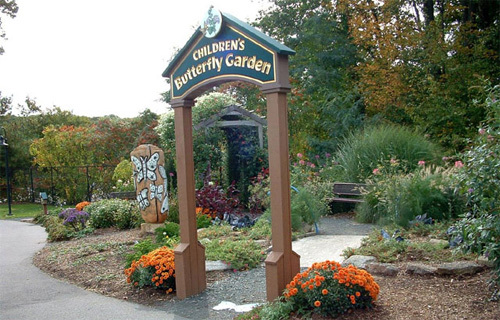 The Children's Butterfly Garden was dedicated on June 21, 2003, and is located in Northwest Park. Inspired by the American Horticultural Society's National Youth Gardening Symposium entitled "Gardening With Kids" in June 2000, the Garden has been recognized with several awards from the Federated Garden Clubs of Connecticut, Inc. and has received a Certificate of Merit in Honor of Dean Day Saunders from the National Garden Clubs, Inc. Trees, perennials, and shrubs are planted with particular attention being paid to those varieties that a butterfly needs for each stage of its development. The permanent planting is enhanced each year with carefully selected annuals. It is maintained through the efforts of a wide variety of volunteers, supported through the generosity of donations and bequests and supervised by a team of dedicated individuals.